Saturday, August 8, 2015. 12:20pm Berlin Time. Mid-way up Kehlstein Mountain, Berchtesgaden, Germany. “Scheiße…” The first word that comes to mind is an expletive but because there is no one in sight, I calculate that it is alright to mutter aloud. The harsh German word fit my predicament like a glove. The altitude laden air around me is laced with heat, nearly 90 degrees of it. My feet are following a blindingly tight curve in the trail and I can do nothing but watch as my only water flask manages to bump out of my pocket and skip down the mountainside. 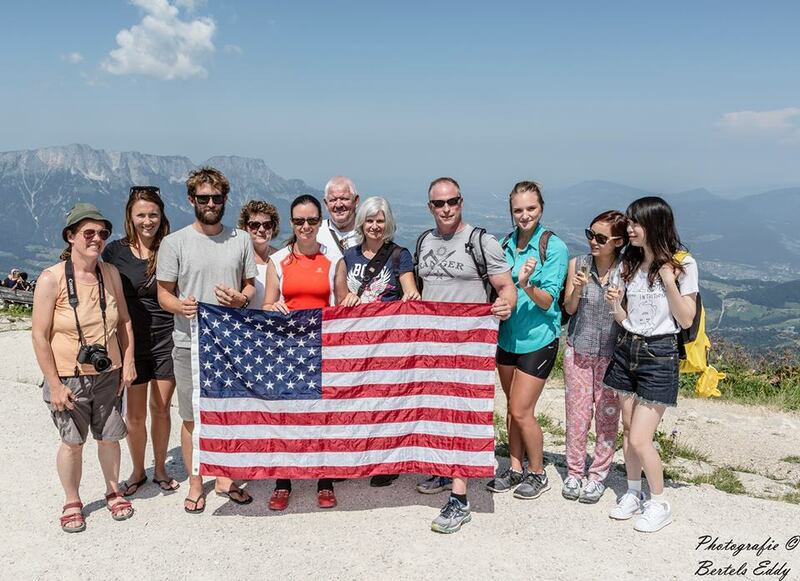 I grip a folded American flag in my right hand and it stays close to me. It is not going anywhere, or I am going down the mountain with it. 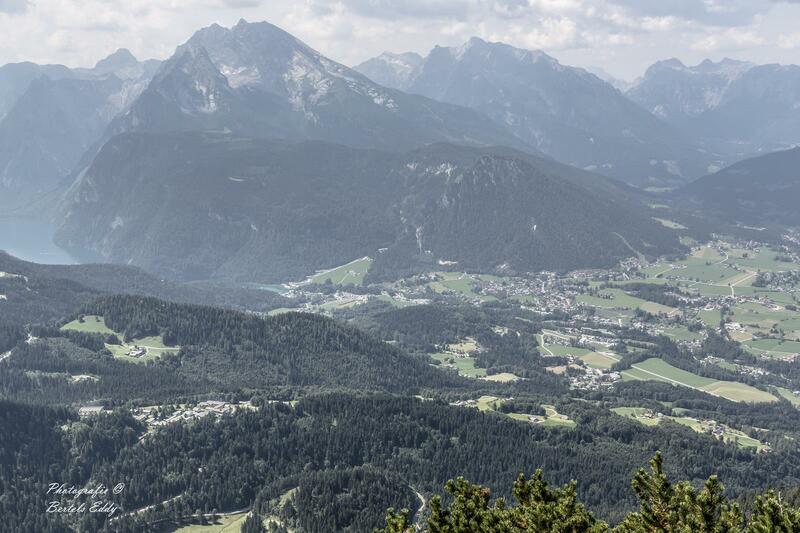 The view from Kehlstein Mountain, stretching into Austria. Photo courtesy of Eddy Bertels. My legs are propelling me up, my heart-rate is up, and my eyes keep glancing there. I tell myself not to look in the direction of the famous mountaintop teahouse of Adolf Hitler, the Eagle’s Nest, seemingly perched perilously above me in a clear blue sky. With every step my only wish is for it to come closer, but it only seems to slip farther away, like a finish line that keeps retreating. I tell myself that it is closer than it seems. To my left, the trail swings into a more maintained surface and my morale is lifted. A wider trail and then a paved path means no more rocks and brambles to fight. What I did not realize is that the reason the trail was created that way is because of the extreme angle of the mountainside and the possibility of runoff damaging a natural route. A 28 percent incline taunts me up ahead. My mind wanders to all the places my feet have taken me since I departed from Sainte-Mère-Église in Normandy, France just 2 months and 2 days ago. I try to think of all the people met. I want to think of the hugs, happy gatherings and shared toasts, but all I can focus on are my legs and how thirsty I am. I check my watch; it is 12:41 and my pace is dropping like the beads of sweat I feel slipping relentlessly down my back. Despite what my mind desires, my body tells me that I must walk. My legs slow down, and my breathing becomes easier in the thin air. Looming still above me is the Eagle’s Nest and I wonder if anyone sees me suffering down here. I do not want them to see me suffer, but I am and I cannot help it. My body feels raw as though every fiber and tendon is burning and exposed to a salty wind. Below my feet the trail is running straight as an arrow up the mountainside. I am hypnotized by the procession of my feet, a uniform step by step. A few seconds slip away and I look up suddenly to see a switchback ahead. For some reason, I begin again to run. Slowly at first, and then my pace quickens. I hit the sharp left-hand turn in the trail and come face to face with another hiker. Another American hiker. And he wants to know about my flag. He asks me about it and then restates the question. I am unfocused and have to blink a few times before I can properly answer him. “My flag?” I ask, stupid with exhaustion. He nods. “My flag,” I whisper to myself. “This flag flew over Camp Toccoa in Georgia. In the United States,” I say. My initial meeting with Mr. Alec Ross. Photo courtesy of Alec Ross. “And what are you doing all the way here with it?” He asks, recognizing my exhaustion. “I ran here from Normandy, France,” I reply matter of factly. He looks at me in disbelief. “Well, not all at once.” That look does not fade. 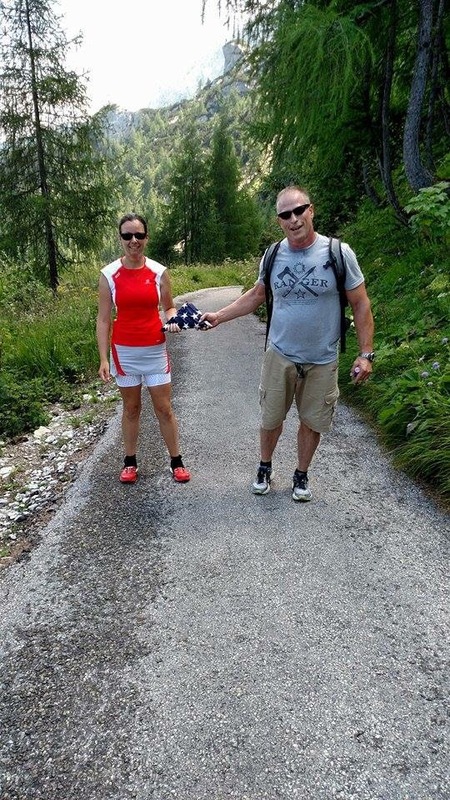 His name is Alec Ross and he is an Army Ranger stationed in Stuttgart, traveling to Berchtesgaden with his friend Ashley, who moves down the trail toward us. 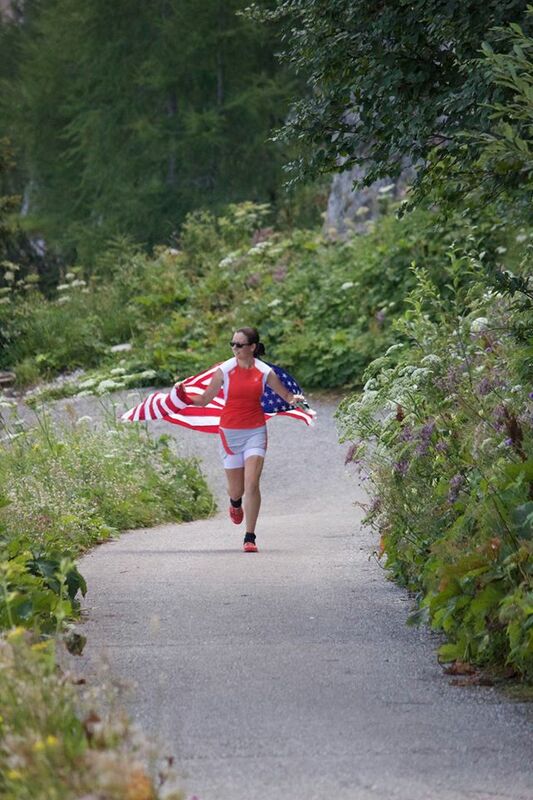 I tell them that thousands of people have passed me by during my travels, and they are part of only a handful who stopped and asked me about my flag. We take a photo together. Just before they turn to leave and continue down the mountain, I ask Alec if he has any extra water: he offers me nearly all of his. We part ways in the same manner I have said goodbye to many on this journey: with a hug, smile and handshake. Thankful for the moment, but it soon fades into the fabric of my journey. I doubt I will ever see the pair again as silence returns to the mountain and I continue my ascent. Out of breath and drenched in sweat, Alec and Ashley are prepared to climb the mountain once again by my side. Content in the pain, Alec’s only request is if he could help me carry the flag up toward the summit, if only for a few strides. I hand it off to him, and we both hold onto one corner of the folded flag. After returning up the mountainside to join me for the finish. Photo courtesy of Alec Ross. This is one of the few moments in my life that I know something important is happening. 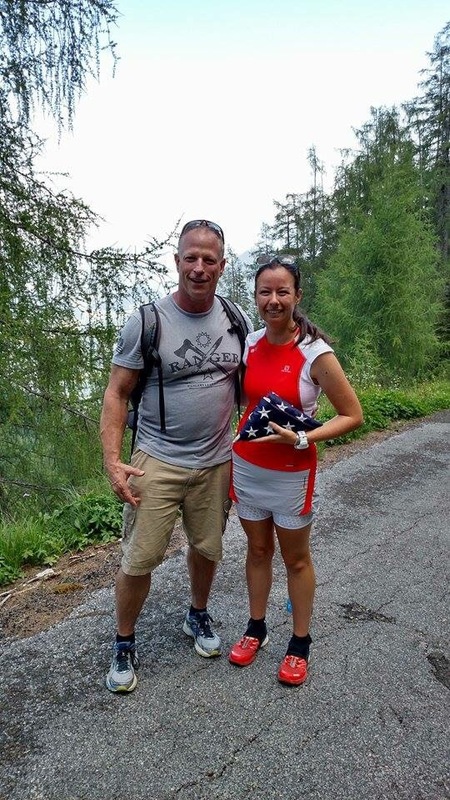 Here I am, a 23 year old runner from North Carolina with a dream and vision, climbing one of the tallest mountains in the Berchtesgadener Alps, sharing the burden of a flag with a US Army Ranger who just happened to be on the same trail as me and at the same time. He did not know it, but Alec was the first person other than myself to hold that flag. They tell me that there are only a few more switchbacks before we reach the top. I look up and the Eagle’s Nest seems closer but still out of reach. The incline slopes upward under our feet. My calves and quads strain. I feel as though I am pushing against gravity itself as I climb. Alec tells me, “Three more turns and you’re there.” We struggle on. “Two more turns.” Our pace quickens. “You’re on your own. It’s all you.” They let me go and slip ahead of me to the top. I stop to take in the moment. There is nothing but blue sky and mountainside around me. The towns below look like tiny dots on a map. Then I see them: Berchtesgaden, Bischofsweisen, Teisendorf; all the little villages my route had taken me through. My two month journey slips away before my eyes: Normandy, France on a June summer day. A cool D-Day morning on Utah Beach laying flowers for those who passed exactly 71 years ago. 60 mile per hour winds blinding me with sand on Omaha Beach. Enjoying Norman seafood with friends. Being chased by a farmer on the cliffs near Point-du-Hoc. Collecting sand on the beachheads. A lightning storm over the ocean. A sea of golden wheat. Fields of cows. The tree lined trails of the Ardennes Forest. Arriving in style in the 101st Airborne Museum in Bastogne. Visiting the Barracks. Sleeping in a foxhole in the Bois Jacques overlooking Foy. Picking flowers in Luxembourg. Seeing the flat plains of eastern Germany from a hilltop castle. Walking the cobblestone streets of Heidelberg. Arriving in Munich for a beer at the Hofbräuhaus. Looking across the ruby red glass surface of Chiemsee at sunset. Seeing the Alps for the first time in the distance. Seeing my finish line. And now, here I am. Just feet from the end. My feet start to run again. The pain leaves my body. All the aches accumulated over the seemingly impossible journey seem to melt away. Tears begin to well in my eyes as I make the final turn and see my team up ahead. Both of my hands fumble with the flag as I run. I lift it above my head, unfurled in all its glory. The final climb to the finish. Photo courtesy of Phoebe Gallagher-Reedman. The flag flickers and sways in the wind. There is a crowd at the trailhead with tears in their eyes, too. I look away from them for a split second down to my right. My glance drifts once again over all the distance I have covered. I smile, completely content in my adventure. My mother catches me in a hug at the finish. I burst into tears. Looking over her shoulder in the embrace, I see my team members Phoebe and Ben looking on. I soon wrap them in a hug. Lastly, come Alec and Ashley, whom I just met but shared a moment with that will last a lifetime. I look at my watch only to realize I had somehow managed to cover nearly 6km with over 3,437 feet of elevation gain in just 1:19:10, over 40 minutes ahead of my projected finishing time. 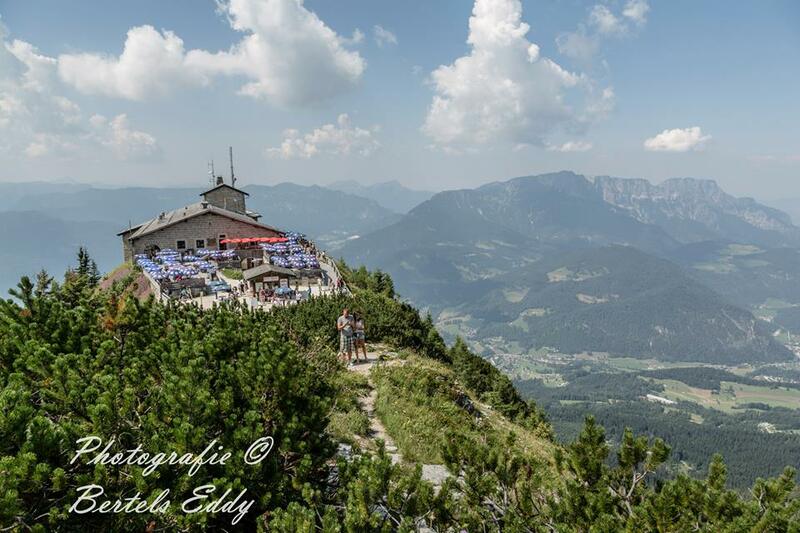 The Eagle’s Nest and its surrounding 360 degree view of the Alps. Photo courtesy of Eddy Bertels. From the trailhead, we walk through a tunnel into the center of Kehlstein Mountain before boarding a golden elevator that takes us 407 feet to the Eagle’s Nest. As a group we step out into the sunshine, high above the tree line. I feel as though I am close enough to touch the sky. To make the ascent official, I need to reach the marker on the summit of the mountain. 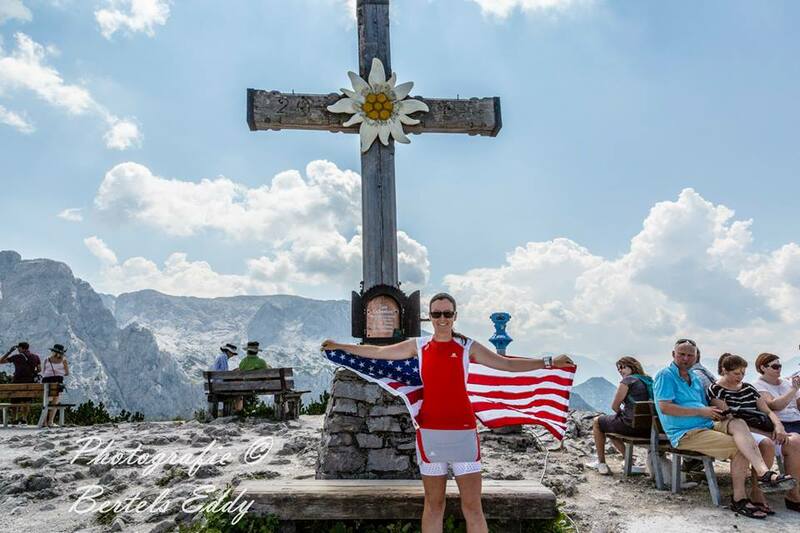 A beautiful wooden cross donned with Edelweiss was my final finish line. And there, standing around it, I find my friends Eddy, Christel, and Mart who drove from Belgium to see my run culminate. The official finishing point of my ascent up Kehlstein Mountain. Photo courtesy of Eddy Bertels. When I embrace them in many hugs, I finally understand that my journey was over: 890 miles through 4 countries in just 2 months. The fact that I have just become the first person to cover the historic route of the 101st Airborne Division during World War II on foot and setting the time record of 59 days 23 hours and 19 minutes barely mattered to me. I look and see all the people’s faces around me. They are sipping champagne, laughing and smiling, much like the men who arrived at the Eagle’s Nest on May 5, 1945. A final toast. Photo courtesy of Eddy Bertels. Sunday, August 16, 2015. 6:00pm Eastern Time. Cary, North Carolina, USA. I arrive home and drop by bags by the front door, my life for nearly three months crammed into just two suitcases: Normandy cider, German beer, flags from the countries I visited, a few books, coffee mugs and chocolate. Each is a memory. And I also have the tan lines: white feet from my shoes, upper legs from my shorts, and around my wrist and finger on my right hand from wearing a bracelet and ring every day. Each is a battle scar. Still today, I have yet to completely absorb what occurred from June until August of 2015. I walk down the sidewalks of my hometown blending once again into obscurity. No more signing autographs, taking pictures or having people recognize me. But I do not blame the people passing me by. You cannot tell just by looking at me that I have returned home from a seemingly impossible journey. What I volunteered for and subjected my body to was not easy. All in all, it appears as though I have lost about 20 pounds, a few toenails and completely destroyed the fat pads under my feet. Everything hurts and I am not comfortable unless I am wearing shoes. But that makes my decision easy. “Scheiße…” I whisper to myself with a smile, “What is wrong with me?” I do not have an answer for myself. Instead, I find myself lacing up my running shoes and heading out the door and onto the road for my next adventure. I would like to take this opportunity to thank those who supported me on my journey. Hopefully I have not missed anyone, though I apologize ahead of time if I do. The team who I owe so many thanks. I could not have done it without this group, without them cheering me on at the finish. I will remember all of you for the rest of my life and thank you every day. Photo courtesy of Eddy Bertels, who I also thank dearly. Thank you to: My mom and all my friends for believing in me and my crazy idea; Emily and Sam for being the best training partners ever and helping me log the mileage in training, I wish you could have joined me every day; Phoebe and Ben for being the best crew members one could as for; Kate and Janie for helping get this project started; Carol and William for encouraging me from the beginning; John for your friendship and seeing me off as my journey began; Keith and Brenda for the well wishes from Toccoa; Mart for your kindness and friendship in following me from day one; Jack for all the laughs and memories; Jacque and Jacqueline for the hospitality in Carentan and a lifelong friendship; the members of the Carentan Manche Athle Centre Sud for guiding me on two days of my journey and making me an unofficial member of your team; Denis and your family for the friendship, hospitality and memories; Paul for organizing for me to meet some of my favorite Band of Brothers actors; Laurent with Eiola Normandy for trail running with me into Port en Bessin; the organizers of the Pegasus Bridge Half Marathon for welcoming me as an ‘elite’ runner; Jason for the running advice and well wishes; Marja and your wonderful husband for all the protein shakes and so much more; Eddy and Christel for the friendship, memories, Airborne beer and a friendship I am sure will last a lifetime; Reg for showing me that my passion for history is still deep; Peter for the friendship and good times; Jo for everything, but especially for making it to Bastogne in a wheelchair; Olivier for the emotional visit to the Bastogne Barracks; Hans for the glorious welcome at the 101st Airborne Museum in Bastogne; Helen for so much that I cannot even put into words, I will cherish our friendship; Max for the guided tour of beautiful Heidelberg; Antti for the tour of Luxembourg City; Veroinka for sharing your 500 year old historic home with my team; Simone for the beautiful cookout and laughs with your family; and Alec and Ashley for the triumphant finish! Also thanks to everyone who followed my journey, my co-workers, friends and sponsors: Skratch Labs, Ultimate Direction, PocketFuel Naturals, Allison of Oiselle, Salomon Running, and Bob and Kathy of Fleet Feet Sports Raleigh & Morrisville. I would not have made it without you. Nice story and I am thankfull being a little part of it ! Miss it already !